Shocking: The Effects Of Negative Thoughts And Emotions On Your Body. Humans can experience emotions from happiness to sadness, or extreme joy and depression. These emotions make different feeling in the body. When we experience various things, our body releases different chemicals that work to create a different environment within the body. So if your brain releases serotonin, oxytocin or dopamine you will feel happy and good, but if your body releases cortisol while you are stressed you will feel the body going into survival mode. What happens when we are thinking negative thoughts all the time? What about when we are thinking positive thoughts? How these affect our boady and life? We spend a lot of time defining what we consider as positive and what we consider to be as negative. The brain is powerful tool and when we are trying to define what is or should be, we begin to have that result play out in our world. For example when someone drive can get cut off and lose his lid, get angry and suddenly feel negative, down and in bad mood, while someone else can get cut while driving and simply apply the brake slightly and move on as if nothing happened. The same experience yet one see it as negative while the other doesn’t. Are things innately positive and negative or we define things as so? There are no positive or negative experiences other than what we define as such. Our perception of an experience or situation has the power as to how we will feel when it’s happening and how our bodies will be affected. We can always work to move beyond our definitions of each experience and move into a state of mind where we simply accept each experience for what it is and use it as a learning grounds for us, we may not be there yet and so it’s important to understand how certain emotions can affect our health. 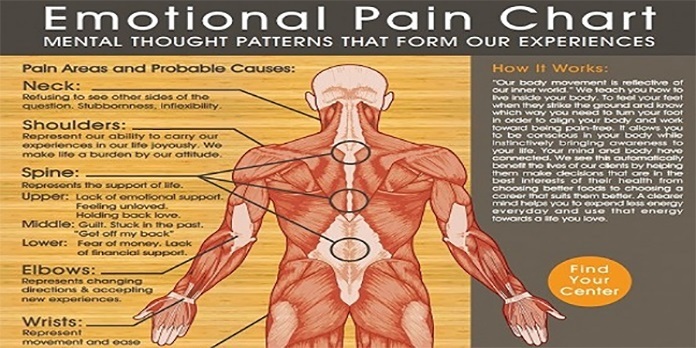 This is a very powerful connection and although it can be visually seen how your mind can affects your physical body. We can have positive mental attitude and deal with our internal challenges and create a healthy lifestyle or we can be in negative, have self-destructive thoughts and not deal with our internal issues, and create an unhealthy lifestyle. Why is this? Emotions and experiences are essentially energy and they can be stored in the cellular memory of our bodies. We all experienced something in our lives that left an emotional mark or pain in a certain area of our body. In that area of your body still hold energy released from that experience that is remaining in that area. Having a pain, injuries in certain areas or tightness, can often be related to something emotionally you are feeling in yourself. This could seem unlikely this way because we are usually very out of touch with ourselves and our emotions. My chronic pains in my back, neck, shoulder or knees, it wasn’t exercise, physio or anything in a physical sense that healed it, it was when i dealt with the emotions behind it. I spent the time and money going to physio and even though i wanted and believed i would get better, something wasn’t being addressed still. The more i addressed the unconscious thought pattern and emotions throughout my body, the more things loosened up and pain went away. When we get sick or feel tightness and pain, often our body is asking us to observe ourselves and find peace once again within us and our environment. This is a learning and growing process we don’t have to judge or fear. Davis Suzuki wrote in ‘The Sacred Balance’, ‘condensed molecules from breath exhaled from verbal expressions of anger, hatred, and jealousy, contain toxins. Accumulated over 1 hr, these toxins are enough to kill 80 guinea pigs!’. When you stay within negative emotions or unprocessed emotional experience throughout the body, we are harming ourselves. You have the power to get through anything life throws at you. Try to see things from a big picture standpoint, instead of labeling with perception the concepts of negative and positive as it relates to each experience you have in your life. Everything can help you see or learn something, or you can use it to shift your perception. You want to clear some emotions within yourself, or realize something within another and accept it? Instead of simply reacting, slow things down and observe, and you will find you have the tools to process emotions and illness quickly when you see them for what they are and explore why they came up. If you believe that you will get sick, and believe you have pain because it’s all out of your control, you will still have it all in an uncontrollable manner until you realize the control you have over much of what we attract within the body. This article was republished from www.healthyfoodteam.com. You can find the original post here.